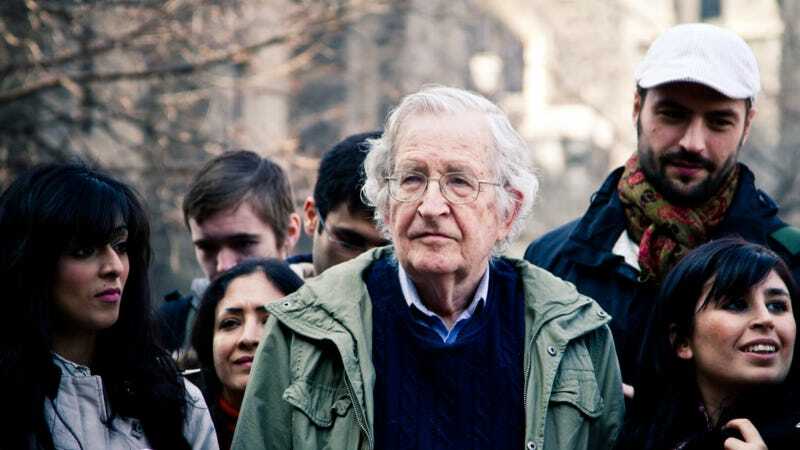 Noam Chomsky has been fighting the establishment for a long time. The esteemed linguist, public intellectual, and political activist has used his pulpit to criticize the American government extensively, especially when it comes to foreign policy and global governance. So you would think Chomsky would consider the biggest news of November 8 to be Trump’s election. But in an interview on Monday with Truthout, Chomsky said the most important news of Nov. 8 was actually “barely noted:"
I think it is important to spend a few moments pondering just what happened on November 8, a date that might turn out to be one of the most important in human history, depending on how we react. …On November 8, the World Meteorological Organization (WMO) delivered a report at the international conference on climate change in Morocco (COP22) which was called in order to carry forward the Paris agreement of COP21. The WMO reported that the past five years were the hottest on record. It reported rising sea levels, soon to increase as a result of the unexpectedly rapid melting of polar ice, most ominously the huge Antarctic glaciers. Already, Arctic sea ice over the past five years is 28% below the average of the previous 29 years, not only raising sea levels, but also reducing the cooling effect of polar ice reflection of solar rays, thereby accelerating the grim effects of global warming. The WMO reported further that temperatures are approaching dangerously close to the goal established by COP21, along with other dire reports and forecasts. Aside from the WMO determining that 2011-2015 was the hottest five-year period on record, on Monday the WMO said that it is very likely that 2016 will be the hottest year on record—breaking a record set just last year. Preliminary data shows that 2016’s global temperatures are approximately 1.2° Celsius above pre-industrial levels. “Another year. Another record. The high temperatures we saw in 2015 are set to be beaten in 2016,” said WMO Secretary-General Petteri Taalas in a statement. “In parts of Arctic Russia, temperatures were 6°C to 7°C above the long-term average. Many other Arctic and sub-Arctic regions in Russia, Alaska and northwest Canada were at least 3°C above average. We are used to measuring temperature records in fractions of a degree, and so this is different,” said Taalas. During the Republican primaries, every candidate denied that what is happening is happening—with the exception of the sensible moderates, like Jeb Bush, who said it's all uncertain, but we don't have to do anything because we're producing more natural gas, thanks to fracking. Or John Kasich, who agreed that global warming is taking place, but added that "we are going to burn [coal] in Ohio and we are not going to apologize for it. …It is hard to find words to capture the fact that humans are facing the most important question in their history—whether organized human life will survive in anything like the form we know—and are answering it by accelerating the race to disaster. “The dangers, however, have been real for many years, perhaps even more so in the light of the forces that Trump has unleashed," said Chomsky.